Many of the leading Docker images such as MongoDB, MySQL and WordPress require data persistence. But is that enough? What else are users asking from their infrastructure as they adopt containers? To find out, we surveyed 648 IT professionals at small, midsize and large enterprises. We asked about current container usage, the benefits users are seeking from container technology, and what—if anything—is standing in the way of greater deployment. 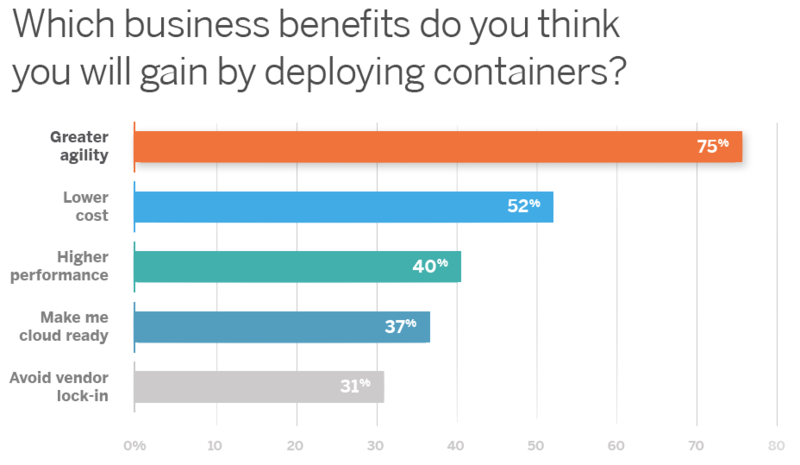 The IT professionals we surveyed recognize multiple benefits of container technology. Topping their list for business value were greater agility, lower cost and higher performance. This makes sense, given that containers are lightweight, efficient and launch in seconds. But how important is agility as users adopt containers? 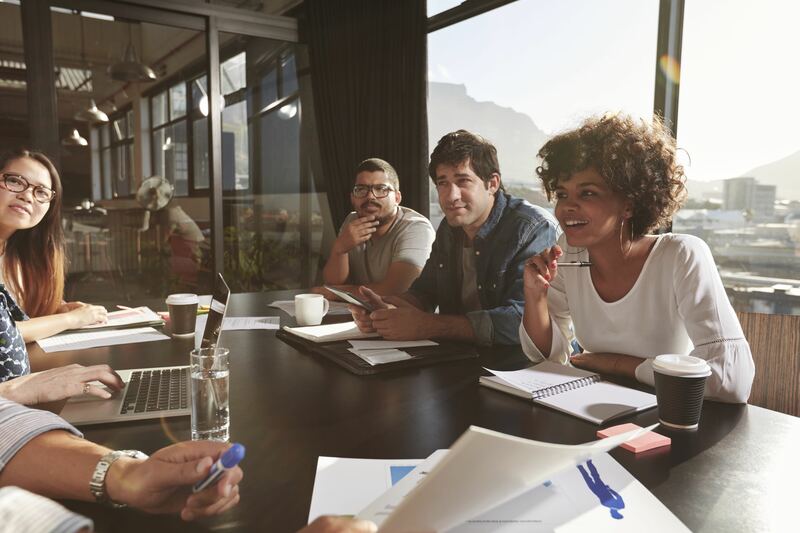 Whether users are just beginning their adoption (<20 percent containerization) or well on their way, agility is almost always the most important factor. But among respondents in the 61 to80 percent containerization cohort, performance and cost reduction overtook agility. 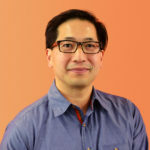 One possibility is that cost reduction and performance gains might not be the catalyst as teams kick the tires of container technology, but cost and performance are on their minds as they move through the adoption curve. Another interpretation is that if users are heavily adopting containers (61 to80 percent level), these users are already focused on cost reduction and performance benefits. Container adoption often starts with web apps, but quickly proceeds to stateful apps. When we asked which application workloads IT professionals were planning to containerize in the next year, “databases” was the most popular response overall. 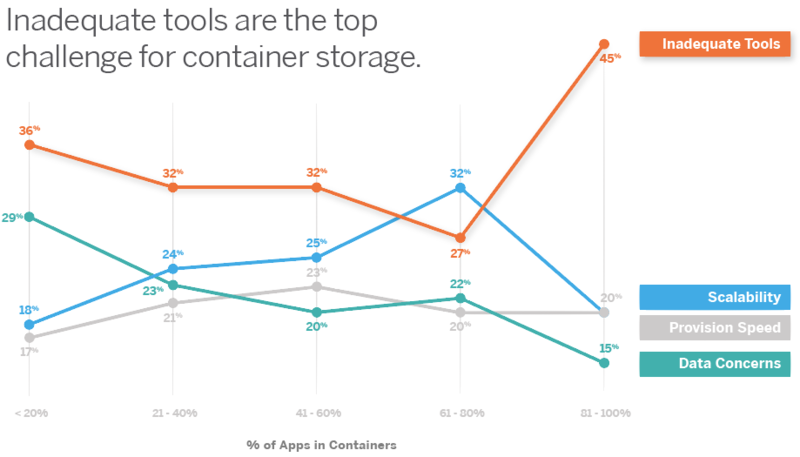 But the types of workloads change as container adoption increases. Web was the most popular with both the least containerized (<20 percent) and most containerized (81-100 percent) segments, perhaps because there are simply more web containers in any given deployment. From the start, however, teams are adopting stateful workloads. Respondents with less than 20 percent container adoption are already trying databases, batch, and to some degree big data workloads. And in the 21 to40 percent and 41to 60 percent segments, databases constitute the largest share of workloads being containerized. The leading pain point was lack of sufficient tools, outweighing speed, scalability and other potential improvements. 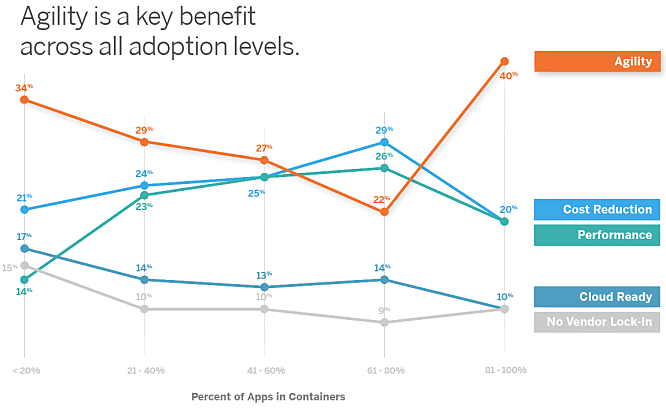 But the deeper story is even more compelling as users adopt containers. By the time users adopt an almost all-container infrastructure (81 to100 percent), inadequate storage tools dominate all other challenges, including speed and scalability. To be clear, it is likely that all other concerns matter, but the lack of adequate storage tools for containers mattered most. This is why we launched Portworx. With the release of PX-Enterprise container-defined storage, we have reimagined the enterprise-class features of legacy data storage—including snapshots, replication and global file namespace. Solving for persistent container storage delivers even more benefits, including data protection, high availability, effortless scaling and multi-cloud capability. Containers run anywhere, scale in seconds and dramatically increase utilization. And now with Portworx, your storage is as agile as your containers. No matter where you fall on the container adoption spectrum, see what Portworx container-defined storage can do for your containerized apps.